With all of the dramatic changes that are happening with the weather and the shifting of temperatures throughout the seasons, many people are looking into investing in a sump pump to protect their homes. Customers that are not in normal areas that would require these items for their home are looking to be informed on what is the best for their home, without having to spend too much money. 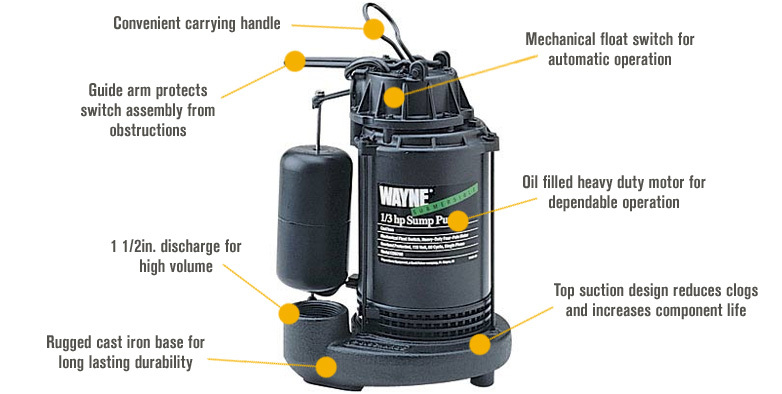 Wayne sump pumps are an investment for your home that you will constantly see a return on. A popular name brand in the Midwest as one of the most efficient and long lasting pump brands, Wayne sump pumps are known to withstand the elements. Whether you are dealing with extreme cold in the winter, this brand will continue to run or the melts that bring extensive flooding. They are durable and made from good quality materials that will allow you the ease of owning a home and not having to worry about your basement or crawlspace filling with water. A good sump pump to think about purchasing is one that has a secondary pump built in. If you are in an area that gets a lot of water, then this is something that is essential. It will give you a buffer of safety for if the primary quits due to excessive water, electrical problems or a lot of use. When you are purchasing a sump pump one of the things that you want to make sure you think about is the size that you will need. Depending on the style of a home, a home will have a sump pit that the pump is installed into. Sump Pumps come in considerably different sizes and it would be a frustrating thing for any home owner to purchase a pump that will not fit into the pit and have to go back to a store to exchange it, or even worse have it shipped back to a company for a different one. It is always good to check on the size of the pit and to also make sure that the pump has a motor in it that is proportionate to the needs of the area around your home. Having a good reliable pump in your home, helps with the safety of your home and is beneficial when you are dealing with insurance as well. It can be overwhelming as a first time buyer, to know which type to use and all the different procedures that follow but, with wayne sump pumps, the quality will be one less thing that you will have to think about and you can spend your energy enjoying your home...and not the maintenance of it.